International Journal of Research in Health Sciences,2014,2,1,94-100. 1,3,4,5Assistant Professor, Department of Community Medicine, Bundelkhand Medical College, Sagar (MP), INDIA. 2Professor, Department of Community Medicine, G.R Medical College, Gwalior (M.P. ), INDIA. Background: Lymphatic Filariasis (LF) is a serious socio-economic and public health problem in the world. As on December 2006 the total population at risk for LF was estimated to be 1254 million in 83 endemic countries of which 64% contributed by South-East Asia Region alone. In India, it is estimated that 554.2 million populations are at risk of LF infection in 2433 implementation units (districts). Objective: The present study was aimed to evaluate coverage and compliance rate of Mass Drug Administration for Lymphatic Filariasis in Rewa and Chhindwara districts of Madhya Pradesh, India. Methods: It is a community based cross-sectional study which was undertaken in four clusters (3 Rural and 1 Urban) in each of two districts from April to June 2012. In each district 120 households were surveyed (30 households from each cluster). From each cluster, one village was selected randomly for household survey. Ineach village, 30 households were surveyed randomly. Results: The average family size was 4.9 and the respondent males and females were almost equal. The eligibility coverage of District A and District B were 80.42%and 95.01% respectively and on spot consumption of two districts were 84.5% and 85.55% respectively. IEC activity was reported to be seen by 70.83% and 95% in District A & B respectively. 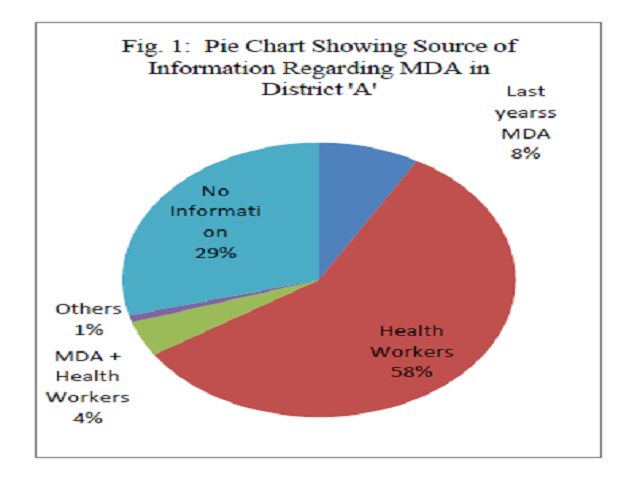 Conclusion: This evaluation study noted that MDA is restricted to tablet distribution only and the major issues of implementation in compliance, in health education, side effects and morbidity management and the logistics were not been given due attention. The implementation should be strengthened immediately in the MDA Programme in India to achieve the goal of LF elimination by 2015.